Hello Artzy friends!! Hope everyone is having a wonderful week. We’re having some very nice spring-like weather here in Colorado which is giving people a bit of the spring fever. I doubt old man winter is done with us just yet as February & March are typically our snowiest months. Today, I decided to share a different type of card and by different I’m referring to shape. Like many card makers, my normal go-to is an A2 size card. It’s comfortable to work with a familiar shape and size when making cards and it makes layouts a breeze. However, today I’m here to tell you that circular card styles need love too. I’d poked around on Instagram and other blogs and noticed that in the crafting world you don’t see many circular style cards. I wonder why? I decided to make a circular card with the Dare 2B Artzy stamp set called Paisley Bliss. To create a card base that is circular you have to use a circle die and position the die so that the folded edge of the cardstock paper is below the cut line of the die. This will create the folded edge of the card – essentially you’ll have 7/8 of a circle, but one edge will be flat for the fold. I’ve included a picture for reference, but I placed my die face up with the paper underneath it so you could see the cut line of the circle die in relation to where I’ve placed my paper. That is how you’d run it through your die cut machine – with the die facing your paper obviously depending on the type of die cut machine you use. The size of the circle die I used to create my card base was 3 3/4″. While I could have utilized my card base and stamped my image & sentiment directly onto the base, I wanted to jazz up my card by cutting a scalloped circle from some lighter teal cardstock that was just a bit larger than my card base. The scalloped die measured 4 1/4″ from edge to edge. This would form the main layer for the card front. The scalloped layer kind of creates the look of a flower which I really like. I die cut another circle that measured 3 3/4″ (the same size as my card base) from some red cardstock and layered it on top of the scalloped layer. For the final layer that would be on the top, I grabbed a circle die that measured 3 1/4″ and I laid out the different stamps from the Paisley Bliss stamp set and placed them inside the circle die to see which stamps would be the best fit for the space. This allowed me to visualize the placement of the sentiment as well. I chose the “Creativity Takes Courage” quote from Matisse which is a quote that I love. Once I’d figured out the placement of the sentiment and stamp I would color, I went ahead and die cut the circle using some white cardstock. Once my circle was cut out, I placed it into my MISTI and stamped the gorgeous leaf and sentiment with some black ink and embossed it with some clear embossing powder to give it some dimension. For clear embossing with black ink, just be sure to use an ink that stays wet a bit longer so you’ll have time to get the clear embossing powder to stick to the ink. Most pigment or even hybrid ink will stay wet long enough to do this. I colored the leaf with my Copics using BG11, BG34, BG23 and BG49 for the blue-green colors and R43, R35, R37 and R39 for my red tones. I added a bit of clear Wink of Stella, but I couldn’t seem to capture the sparkle in my photos. I assembled the card so that the sentiment would flow from top to bottom along side and curving around the leaf. I added a few pearls to the card for some dimension. Now that I’ve created my first ever circle card I’m wondering why I haven’t done circular cards before. I think it turned out so cute. I think this would be the perfect card to give to an Artzy friend. Hope you enjoyed seeing something with a bit of a different shape from the norm today! Remember, its February so we’ll have a new challenge theme up for everyone to participate in starting on Sunday, February 5th. Be sure to check out the Dare 2B Artzy blog for the details on this month’s challenge. Hope you can join in on the fun! 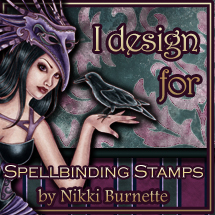 Also, don’t forget that all of the FABULOUS new stamps and dies for 2017 are up in the Dare 2B Artzy store. You can find them all in the What’s New section of the store. ← Artzy Weekend Sneak Peek! You’ve inspired me to make a circle shaped card! Thanks Melody! Yes, I’m really asking myself why I’d not made one before.